There are many forms of corrosion. The form of corrosion depends on the metal involved, its size and shape, its specific function, atmospheric conditions, and the corrosion producing agents present. 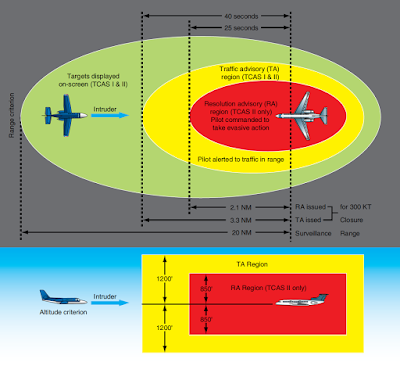 Those described in this post are the more common forms found on airframe structures. Filiform corrosion is a special form of oxygen concentration cell that occurs on metal surfaces having an organic coating system. It is recognized by its characteristic worm-like trace of corrosion products beneath the paint film. 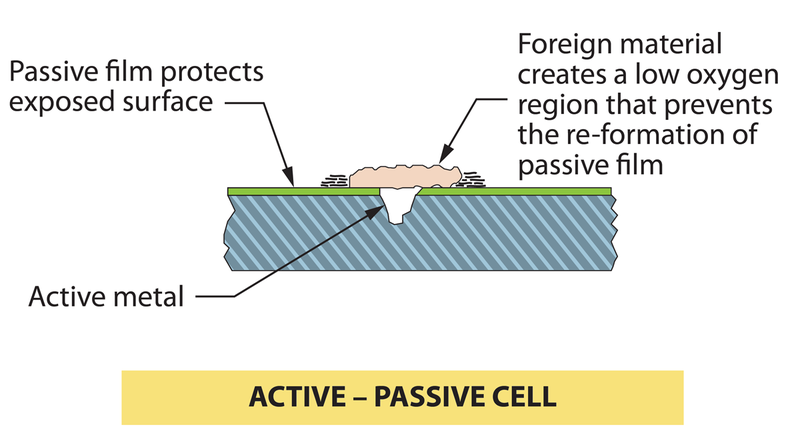 [Figure 2] Polyurethane finishes are especially susceptible to filiform corrosion. Filiform occurs when the relative humidity of the air is between 78–90 percent, and the surface is slightly acidic. This corrosion usually attacks steel and aluminum surfaces. The traces never cross on steel, but they cross under one another on aluminum, making the damage deeper and more severe for aluminum. If the corrosion is not removed, the area treated, and a protective finish applied, the corrosion can lead to intergranular corrosion, especially around fasteners and at seams. Filiform corrosion can be removed using glass bead blasting material with portable abrasive blasting equipment or sanding. 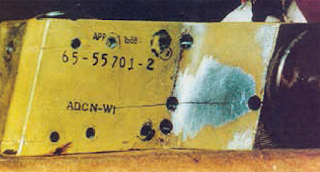 Filiform corrosion can be prevented by storing aircraft in an environment with a relative humidity below 70 percent, using coating systems having a low rate of diffusion for oxygen and water vapors, and by washing the aircraft to remove acidic contaminants from the surface, such as those created by pollutants in the air. 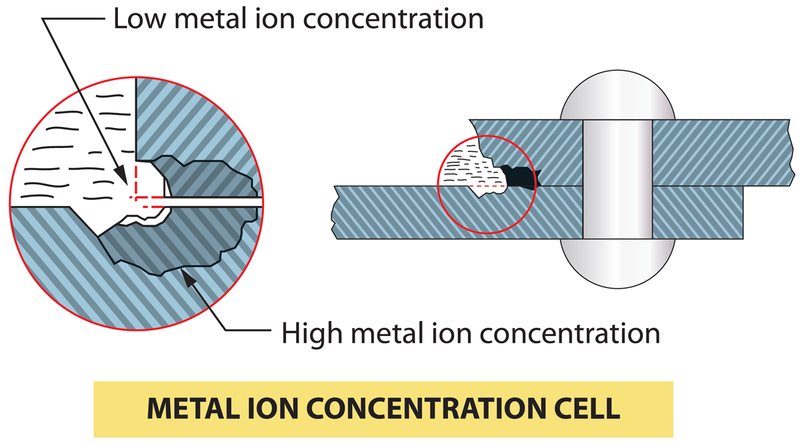 The contamination of a metal’s surface by mechanical means can also induce dissimilar metal corrosion. The improper use of steel cleaning products, such as steel wool or a steel wire brush on aluminum or magnesium, can force small pieces of steel into the metal being cleaned, causing corrosion and ruining the adjoining surface. Carefully monitor the use of nonwoven abrasive pads, so that pads used on one type of metal are not used again on a different metal surface. 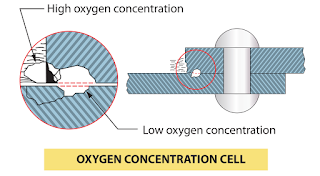 Concentration cell corrosion, (also known as crevice corrosion) is corrosion of metals in a metal-to-metal joint, corrosion at the edge of a joint even though the joined metals are identical, or corrosion of a spot on the metal surface covered by a foreign material. Metal ion concentration cells, oxygen concentration cells, and active-passive cells are three general types of concentration cell corrosion. The solution may consist of water and ions of the metal that are in contact with water. 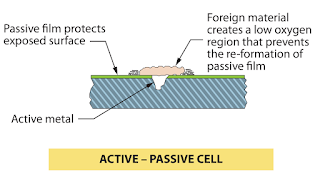 A high concentration of metal ions normally exists under faying surfaces where the solution is stagnant and a low concentration of metal ions exist adjacent to the crevice, created by the faying surface. 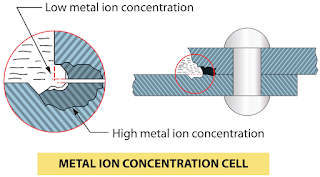 [Figure 5] An electrical potential exists between the two points: the area of the metal in contact with the low concentration of metal ions is anodic and corrodes; the area in contact with the high metal ion concentration is cathodic and does not show signs of corrosion. 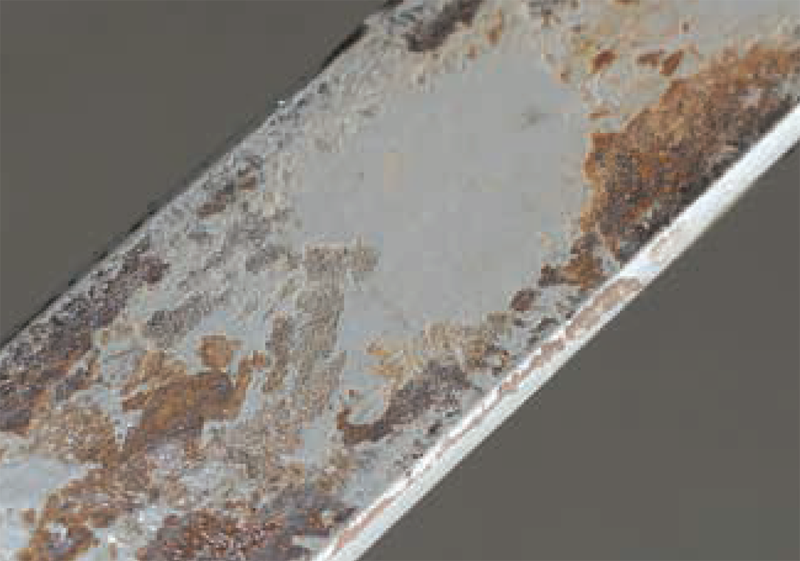 This type of corrosion is an attack along the grain boundaries of an alloy and commonly results from a lack of uniformity in the alloy structure. Aluminum alloys and some stainless steels are particularly susceptible to this form of electrochemical attack. [Figure 8] The lack of uniformity is caused by changes that occur in the alloy during the heating and cooling process of the material’s manufacturing. 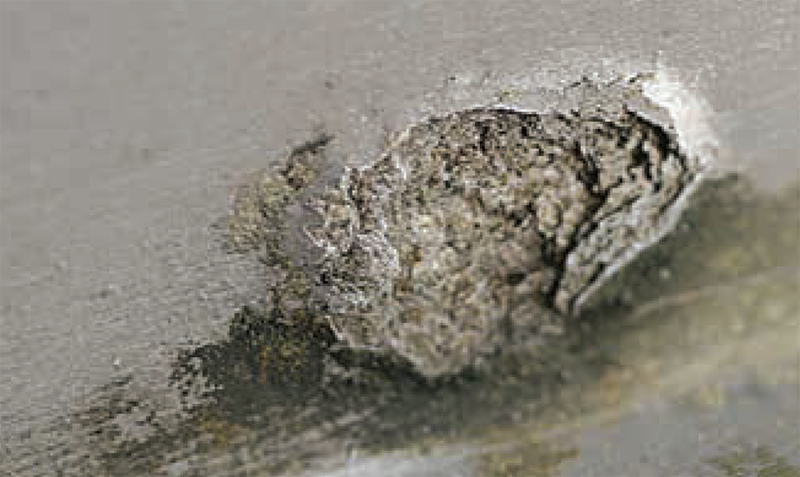 Intergranular corrosion may exist without visible surface evidence. High-strength aluminum alloys, such as 2014 and 7075, are more susceptible to intergranular corrosion if they have been improperly heat-treated and then exposed to a corrosive environment. 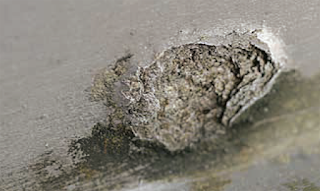 Exfoliation corrosion is an advanced form of intergranular corrosion and shows itself by lifting up the surface grains of a metal by the force of expanding corrosion products occurring at the grain boundaries just below the surface. [Figure 9] It is visible evidence of intergranular corrosion and is most often seen on extruded sections where grain thickness is usually less than in rolled forms. This type of corrosion is difficult to detect in its initial stage. Extruded components, such as spars, can be subject to this type of corrosion. Ultrasonic and eddy current inspection methods are being used with a great deal of success. 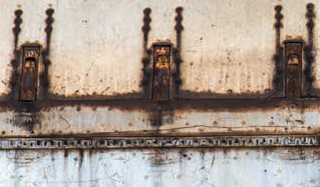 This form of corrosion involves a constant or cyclic stress acting in conjunction with a damaging chemical environment. The stress may be caused by internal or external loading. [Figure 10] Internal stress may be trapped in a part of structure during manufacturing processes, such as cold working or by unequal cooling from high temperatures. Most manufacturers follow these processes with a stress relief operation. Even so, sometimes stress remains trapped. The stress may be externally introduced in part structure by riveting, welding, bolting, clamping, press fit, etc. If a slight mismatch occurs or a fastener is over-torqued, internal stress is present. Internal stress is more important than design stress, because stress corrosion is difficult to recognize before it has overcome the design safety factor. The level of stress varies from point to point within the metal. Stresses near the yield strength are generally necessary to promote stress corrosion cracking. However, failures may occur at lower stresses. Specific environments have been identified that cause stress corrosion cracking of certain alloys. Salt solutions and sea water cause stress corrosion cracking of high-strength, heat-treated steel and aluminum alloys. Methyl alcohol-hydrochloric acid solutions cause stress corrosion cracking of some titanium alloys. Magnesium alloys may stress corrode in moist air. Stress corrosion may be reduced by applying protective coatings, stress relief heat treatments, using corrosion inhibitors, or controlling the environment. Shot peening a metal surface increases resistance to stress corrosion cracking by creating compressive stresses on the surface which should be overcome by applied tensile stress before the surface sees any tension load. Therefore, the threshold stress level is increased. Fretting corrosion is a particularly damaging form of corrosive attack that occurs when two mating surfaces, normally at rest with respect to one another, are subject to slight relative motion. 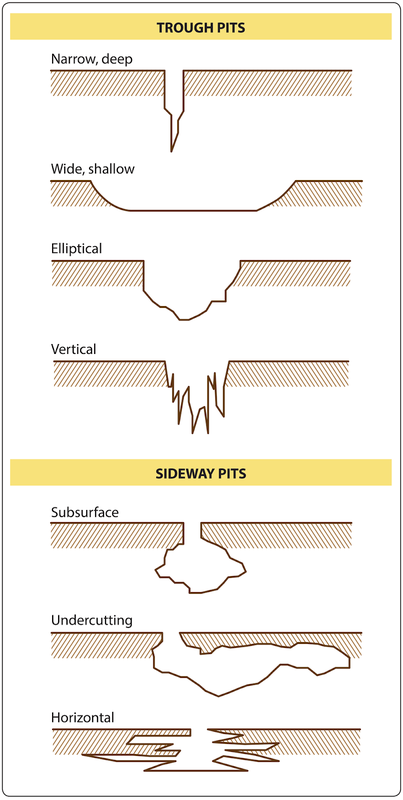 It is characterized by pitting of the surfaces and the generation of considerable quantities of finely divided debris. Since the restricted movements of the two surfaces prevent the debris from escaping very easily, an extremely localized abrasion occurs. [Figure 11] The presence of water vapor greatly increases this type of deterioration. 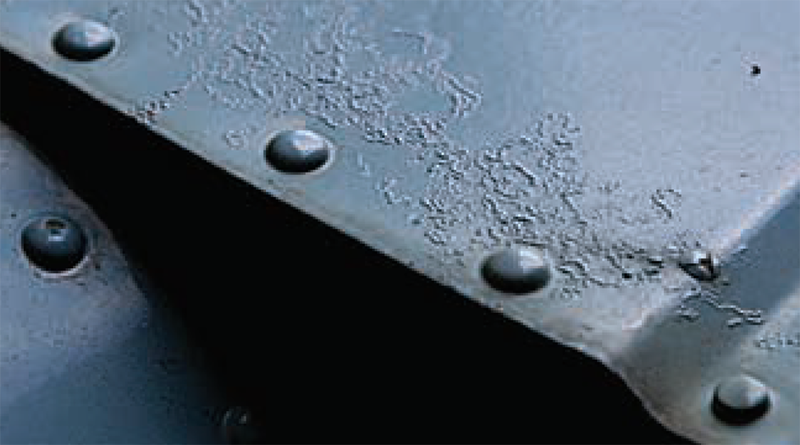 If the contact areas are small and sharp, deep grooves resembling brinell markings or pressure indentations may be worn in the rubbing surface. As a result, this type of corrosion on bearing surfaces has also been called false brinelling. 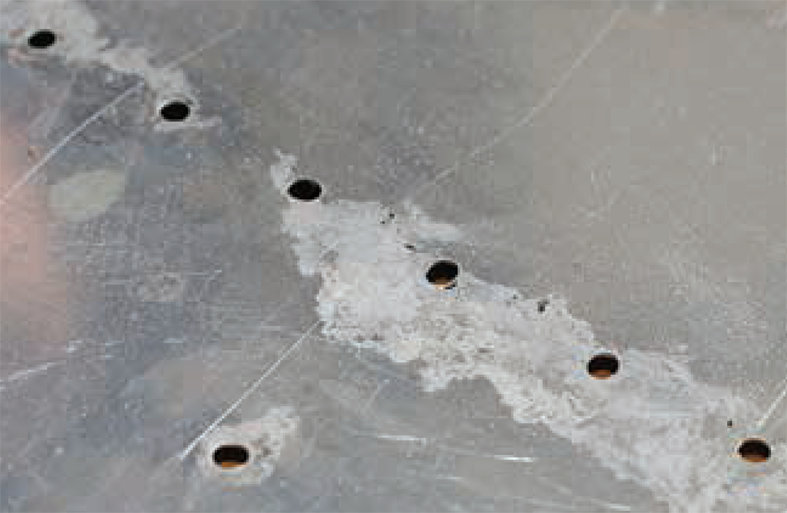 The most common example of fretting corrosion is the smoking rivet found on engine cowling and wing skins. This is one corrosion reaction that is not driven by an electrolyte, and in fact, moisture may inhibit the reaction. A smoking rivet is identified by a black ring around the rivet. 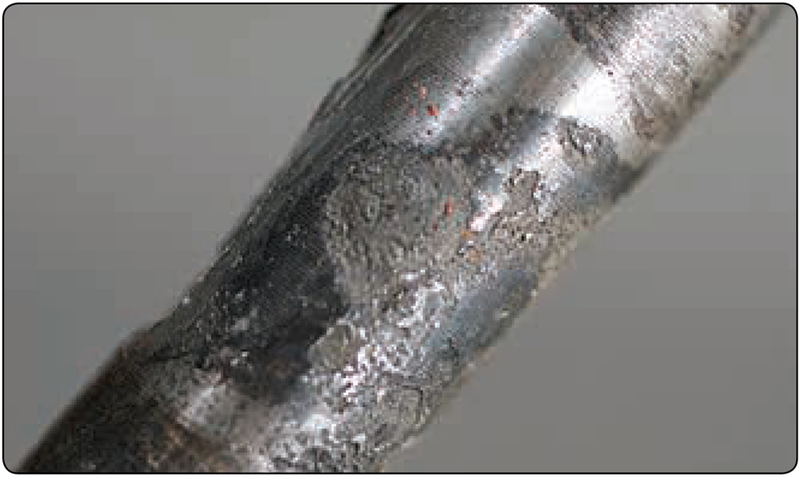 Fatigue corrosion involves cyclic stress and a corrosive environment. Metals may withstand cyclic stress for an infinite number of cycles so long as the stress is below the endurance limit of the metal. Once the limit has been exceeded, the metal eventually cracks and fails from metal fatigue. However, when the part or structure undergoing cyclic stress is also exposed to a corrosive environment, the stress level for failure may be reduced many times. Thus, failure occurs at stress levels that can be dangerously low depending on the number of cycles assigned to the life-limited part. Fatigue corrosion failure occurs in two stages. During the first stage, the combined action of corrosion and cyclic stress damages the metal by pitting and crack formations to such a degree that fracture by cyclic stress occurs, even if the corrosive environment is completely removed. The second stage is essentially a fatigue stage where failure proceeds by propagation of the crack (often from a corrosion pit or pits). It is controlled primarily by stress concentration effects and the physical properties of the metal. 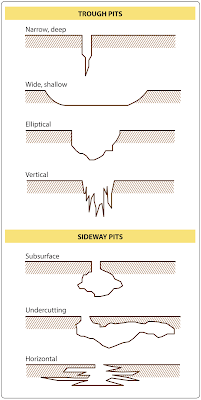 Fracture of a metal part due to fatigue corrosion generally occurs at a stress level far below the fatigue limit of an uncorroded part, even though the amount of corrosion is relatively small. Galvanic corrosion occurs when two dissimilar metals make electrical contact in the presence of an electrolyte. [Figure 12] The rate which corrosion occurs depends on the difference in the activities. The greater the difference in activity, the faster corrosion occurs. The rate of galvanic corrosion also depends on the size of the parts in contact. If the surface area of the corroding metal is smaller than the surface area of the less active metal, corrosion is rapid and severe. When the corroding metal is larger than the less active metal, corrosion is slow and superficial.